Growing up on a farm, walking the land, working in the fields, tending the farm animals, and listening to the soft words of his family as the darkness folded into the night, Richard Quinney has spent a lifetime contemplating the nature of reality. 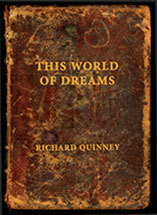 In This World of Dreams, a year passes as Quinney tells the stories that come, as in a dream, of things past, of the ancestors that once lived, and of the wonders of everyday life. The revels will end in this relative world of dreams. Yet the fruits of the year’s quest prompt thoughts, and more dreams, of an absolute realm beyond this dream world. For the time being, we are the keepers of the wonders of our existence.